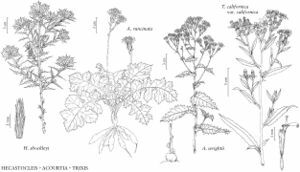 Plants 30–120 cm. Leaves cauline; sessile; blades oblong-lanceolate to elliptic-oblong, 2.5–13 cm, bases sagittate or clasping, margins dentate to denticulate, faces minutely stipitate-glandular and/or hirtellous (reticulate). Heads in corymbiform arrays. Involucres turbinate, 5–8 mm. Phyllaries in 2–3 series, linear to lanceolate, margins fimbrillate-glandular, apices obtuse to acute, abaxial faces glabrous or glandular-hairy. Receptacles reticulate (edges of sockets glandular). Florets 8–12; corollas pink or purple, 9–20 mm. Cypselae linear-fusiform, 2–6 mm, glandular-puberulent; pappi bright white, 9–12 mm. 2n = 54. Ariz., N.Mex., Tex., Utah, Mexico (Chihuahua, Coahuila, Durango, Nuevo León, San Luis Potosí, Sonora, Zacatecas).